Image 1. 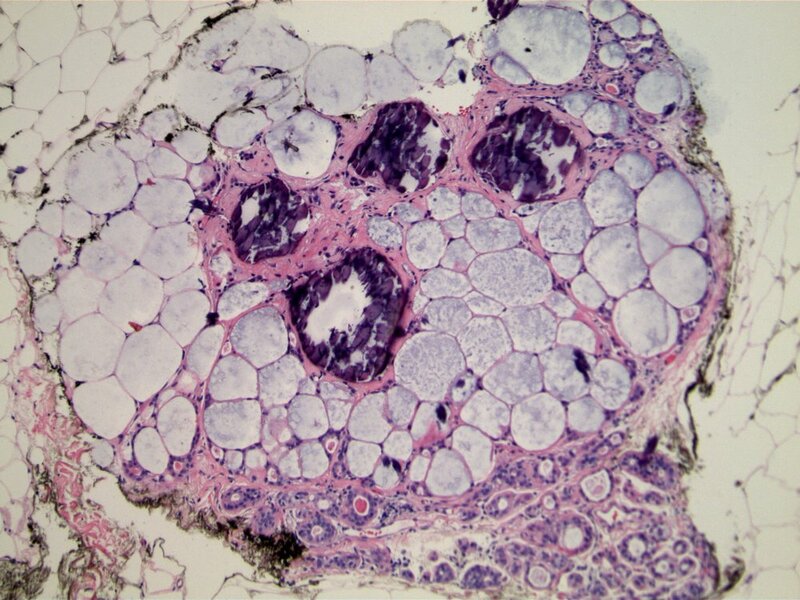 Low power photomicrograph showing several lobular units and terminal ducts. 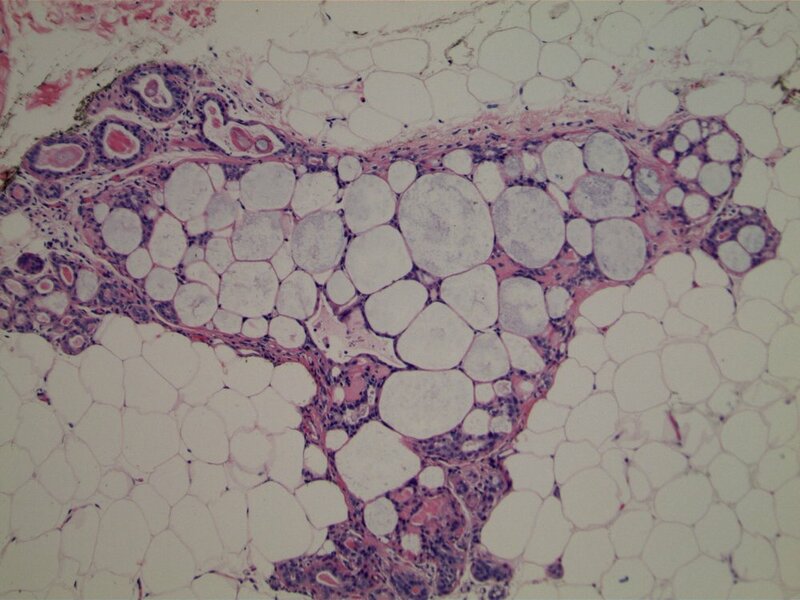 Approximately half of the lobular units show striking cribriform architecture. Images 2-5. The nature of the cribriform structures is evident at higher magnification. The rounded structures are spherules of eosinophilic material bounded by acellular basement membrane material, with focal calcifications. Discussion: First described by Clement et al in 1987, collagenous spherulosis is a benign, usually incidental finding. The spherules are composed of collagen and variable amounts of acidic mucin, basement membrane-like material, and elastin. The differential diagnosis includes atypical ductal hyperplasia and low grade ductal carcinoma in situ, as well as adenoid cystic carcinoma. ADH and DCIS are excluded by the recognition that the spherules are not crisp secondary spaces bounded by monomorphic epithelial cells. Adenoid cystic carcinoma has some of the same histochemical staining properties as collagenous spherulosis, but should show an infiltrative pattern. Collagenous spherulosis does not require excision if detected in a core biopsy specimen, and is not associated with an increased risk for later cancer development. Clement PB, Young RH, Azzopardi JG. 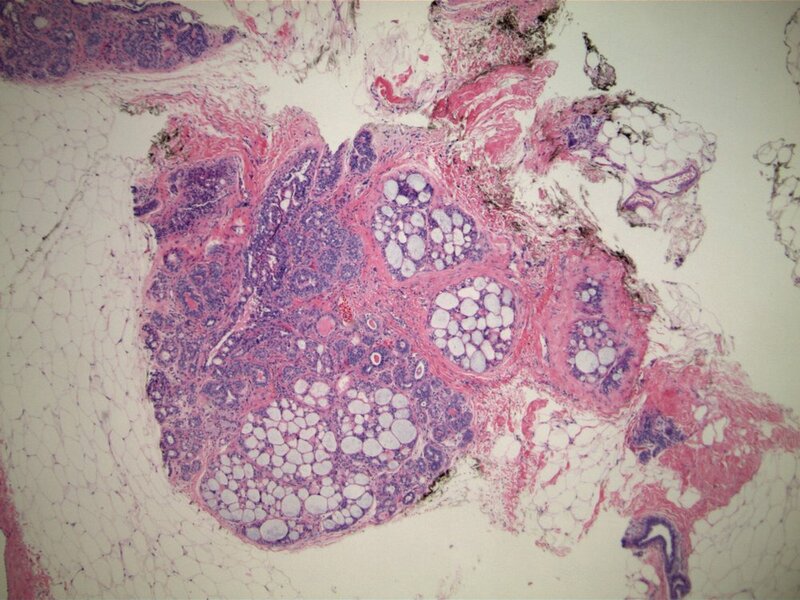 Collagenous spherulosis of the breast. Am J Surg Pathol 1897; 11:411-7.